To make the picture more clear, that is a birthday cake in front of Marge. It's her birthday. I think given that information you should be able to figure out the rest. 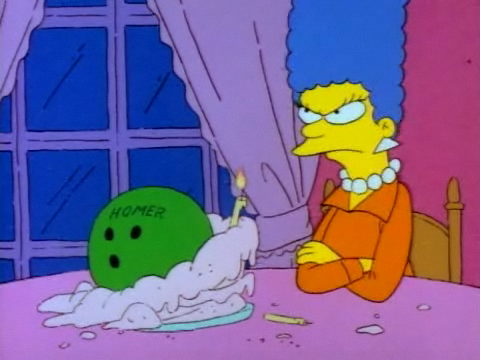 Homer bought Marge something he wanted as a gift so he could use it. I finally just beat LoH!! I'm a little torn on what I think of the ending though.... The ending itself was really good but I still have so many questions I need answerred.... I really did love this game though... In fact I am gonna go tattoo a bracer symbol on myself right now! Hahahaha! , I just may have convinced my friend to let me get this for her as a Christmas gift. I do hope so; I've wanted to play this game ever since the reviews rolled in. I don't know how people, not living under the same roof, could share an RPG. Are you going to wait until she's finished to play? It's a fun game though. She might like it. A combination of borrowing games and the fact that at least once a week her parents adopt me for the day make it easy to share long games with each other. I picked this back up after putting it down a few months ago. I'm in Chapter 1 and just met Olivier and I think he is the best person in any game ever. He will never leave my party as long as I have a choice. Love and peace, baby! I didn't read it, but you might want to put it in the code. It's the number symbol. Think of it as the spoiler option.
. . . Man, I actually think that's one of the most insignificant things that can even be a spoiler. For future reference however when a real spoiler is used: it's [ code ] [ /code ] without the spaces. Did you guys know this game has graphics? Also doesn't hurt to add what kind of spoiler it is. You might have people who are farther than you and can help you, but won't read it due to not beating the game yet and they don't know what kind of spoiler it is. Early game spoiler, mid-game spoiler, sidequest spoiler, etc. are a nice addition so people know if it's safe to read or not. Also, can't you click on the item in your inventory to show a picture of it? I'm fairly certain you can with your emblem. been playing this here and there. So much going on in this game.